I appeared on Radio New Zealand to discuss the recent landslide to the LNP in the State election. I chatted with Bryan Crump, who hosts Nights to offer some views on why the Labor Party in Queensland lost so conclusively. As we know, the people spoke very loudly and delivered a drastic change in our political landscape. What will this mean for Queenslanders over the next few years? The live interview podcast is below. It was without question, one of the most extraordinary elections in Australian history - in terms of swing, majority and a desire for change. The swing to the LNP however was not uniform. The primary vote in some LNP seats was actually down, so some voters uncomfortable with Labor, supported independents or Katter's Australian Party. Another defining feature of this election showed that The Greens lost forward momentum. In Cairns, Mulgrave and Barron River, the Green vote collapsed. 38% of voters who chose Greens in Mulgrave in 2009, abandoned the Party in this election. 34% left them in Cairns, 27% in Barron River and 19% in Cook. This was more than three times than that State average at 9.5%. KAP gained from both left and right. In seats where there was a strong One Nation vote prior to 2004, they seemed to do the best, as they did in Baron River and Mulgrave. It's fair to surmise that the ALP lost because of a number of mitigating factors. The substantial debt; ignoring voters and party faithful; negative campaigning; the outcome of the 2012 Flood report; the Health payroll debacle; and not least of all, the programme of asset sales, a broken promise that Labor took to the 2009 election and also a fundamental tenant of their Party Platform. With Queensland's debt approaching in excess of $50 billion, more than all States combined, forecast to peak $80 billion by the end of 2014, it was revealed yesterday that borrowing was paying State sector staff salaries in the last three years. The implications of Katter's Australian Party is interesting, even though they only captured two seats, loosing their Queensland leader Aiden McLindon along the way. On a Federal level the emerging Party bodes well and may gain enough for a Senate seat at the next election, probably at the expenses of Labor seat. KAP 11.5% of the vote. The voting system Queensland and New South Wales has Optional Preferential Voting. Most Australian elections run under full-preference preferential voting, where all candidates must be numbered in order of the preference of the voter, or the vote will not be counted. Under OPV voters may choose to mark a preference for one candidate, effectively voting as though it were a first-past-the-post election. In 1992 the Goss Labor government introduced OPV, at the time the non-Labor vote was split between the Nationals and the Liberals. In many instances, all three parties fielded candidates in the single member electorates. Previously the Nats and the Libs preferenced each other. The introduction of OPV and the “Just Vote 1” message was designed to cut the link in preference flow between the Nats and the Libs and thus allow for more votes to be exhausted. This worked well as long as the Nats and the Libs were two separate parties. 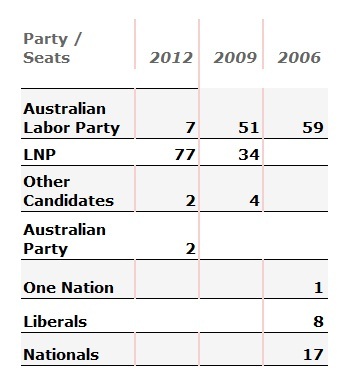 However in 2008 when the two came together as the LNP, the voting advantage was lost. In 2009 The Greens preferenced Labor many seats and that was crucial. It delivered victory to Barron River's Steve Wettenhall as he failed to win on the primary vote. In 2012 Labor and The Greens only had one intense preference deal: Ashgrove, where LNP leader Campbell Newman was up against ALP's Kate Jones, and Labor's Treasurer Andrew Fraser in Mt Coo-tha. This time around in some cases Green candidates actively distanced themselves from Labor. With many votes being exhausted, that is no preferences, it did mean that often candidates were elected with less than 50% of the first preference vote, but despite this the LNP was the most preferred party. You certainly swallowed the hook on that 'revelation' of borrowing for salaries. As posted by Gene Tunny (a former Federal Tresury economist) at Queensland Economy Watch the deficit and borrowing for recurrent spending has previously been publicly disclosed in Qld Treasury documention including the most recent mid-year review prior to the election. Perhaps someone should ask Tim Nicholls why it took him so long to find out, and why he missed it at the time(s) the information was previously released?